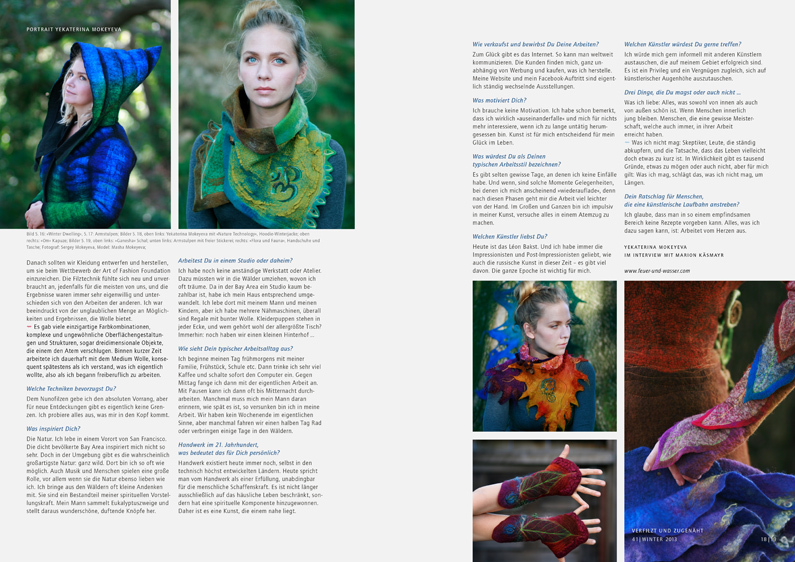 The winter issue is full of creative ideas from international felt makers. 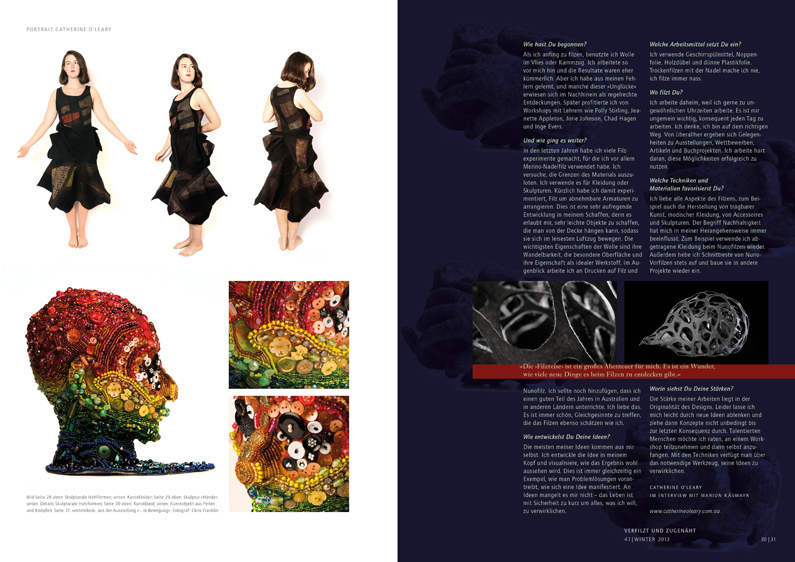 On our cover you can see art by Elena Shutko who looks left and right. She lives and works close to Moskau and she is full of ideas for fashionable clothing and accessories for women and kids. The Russian Yekaterina Mokeyeva chose sunny California as her home base and gets inspired and empowered by nature. Her label »Feuer und Wasser« includes colorful fashion. Doris van Dijk works between beautiful hydrangeas in the Netherlands. Her unique fashion of hand dyed natural colors displays extraordinary designs. She also offers workshops held by international artists. These qualitative workshops also include a wellness character. Christa Saalfrank is German but she lives in Switzerland. She never leaves her house without her embroidery bag and designs felt beads that are unique with a special embroidery. Caroline Magnant from France loves all steps of her felting processes. From laying out the wool to the finished clothing. She loves to draw with wool and to create with her hands. Catherine O’Leary from Australia thinks of felt making as work for the soul. She mastered in Nuno felt and her designs are unbelievable beautiful. 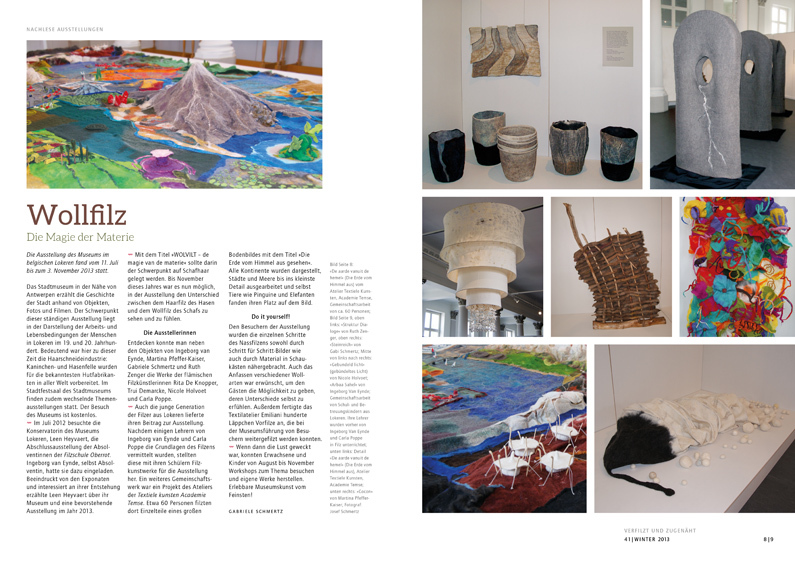 Martien van Zuilen chose felting as her main creative process. She loves the combination of tradition and modernity in felting. Maggie Scott became famous by her great art of scarves. Surfaces with geometrical designs, but also felt combined with free machine embroidery are her trademark. Felt plays a big part in the life of Angelika Brüssel-Bruns. She is saying good-bye in Germany soon and is starting something new. 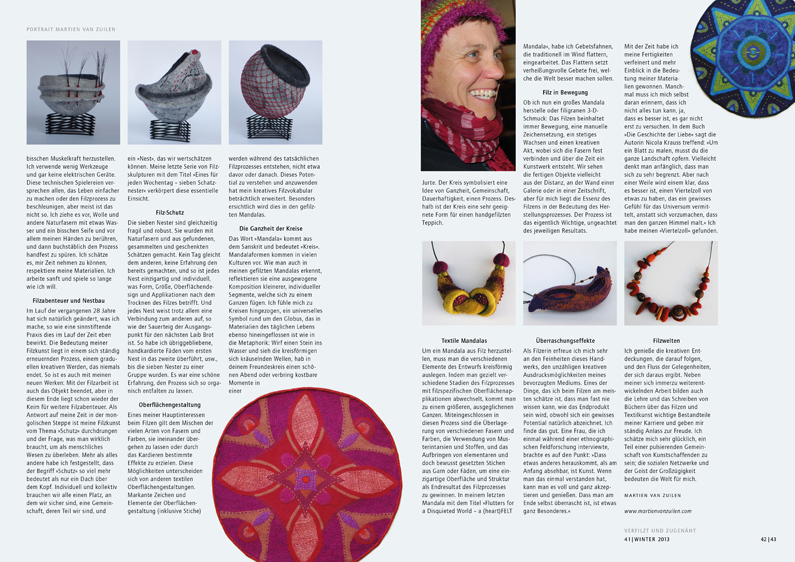 The felters scene in Graubünden presents great creations by their members, that try to promote felt further. Caro Lanzendörfer shows her personal view on the option to combine textile art and the art of healing. Her therapeutic work includes felting and this work shows great success with her clients. Our category Sheep tells you how much commitment and stamina a shepherdess in the city needs. Kerstin Doppelstein proves that landscape work in the city is possible in tune with nature. A gingerbread house for your Season decorations can be found in our Instruction category. Kerstin Dierig´s instruction invites you to needle felt, the instruction is great for beginners and kids. We also introduce all newcomer books to you that would be great as a holiday gift. The longed for third book by Annette Quentin-Stoll, a gallery and instruction book by Gerlinde Merl, and the collected edition »Passion Filz« promise great reading pleasure full of inspiration and ideas for all the felt lovers out there. 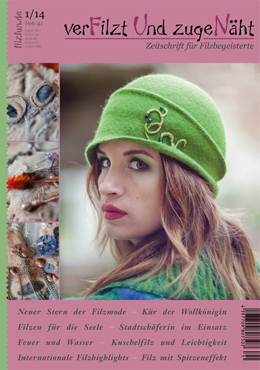 Katharina Thomas, the pioneer of the felters scene has published a book that is traded already as a »must have«.